Thanks to a series of innovative marketing tactics ,the total number of Korean visitor arrivals in the Philippines in 2007 increased to more than 650,000. It was at the end of 2006 when Korea emerged as the No. 1 country generating the largest inbound tourist traffic to the Philippine overtaking the United States. Since that time on, Korean visitor arrivals in the Philippines has been growing at double-digit per year. "Major driving force behind this spectacular growth of Korean visitor arrivals in the well-organized marketing blitz , which is the brainchild of Philippine Tourism Secretary Joseph Ace Durano and his Team Korea led by Ms Maricon Basco-Ebron," said US Chung, former president of the Korea Tourism Association in a recent interview with the Seoul Times. Chung, who is now chairman and CEO of Seoul Air Travel Inc., said that the Philippines has solidified its branding image as undisputed top destination for Korean holidaymakers, students, honeymooners, FITs and single ladies. "In my view, the Philippine Specialist Program 2007 and Philippine Campus Road Show 2007, were among the most successful promotional events ever organized here by DoT,"he said pointing out that number of repeaters to the Philippines is on the increase nowadays. The Philippines has made history when it attracted a little over three million foreign tourists last year, which compared to the previous years, which translates to four billion dollars. The increased in the visitor traffic has resulted in the increased expenditure, which recorded a growth rate of 40.99 percent reaching US$4.885 billion, surpassing the US$3.782 billion target for 2007. "Ultimately, DOT aims to attract not only more tourists, but also higher value visitors who stay longer and spend more, generating more opportunities for the country," Ms Maricon Basco-Ebron, tourism director and attache in Korea said. DoT joins Weddex Korea 2008 Spring , which opened at COEX in southern Seoul on Jan. 18 for a five-day run. This is the first time for DoT to join the Spring edition of the Weddex, the first in series of the wedding fairs for New Year. The spacious Philippine pavilion with unique designs at strategic location of the exhibition showcases top honeymoon destinations for Korean newly weds. WEDDEX started in 1992 and tremendous support from both participating companies and consumers made this exhibition possible to be held biannually from 1996 up to now. "It is a very important exhibition for the participating companies for the Philippines as the fair enhances company profiles, maximizes sales promotion and demonstrates the marketability of our products," said Ms Maricon Basco-Ebron. Eight representatives from the Philippines are joining the event to captivate would-be Korean brides and to eventually lure them to the secluded paradise in the Philippines. Boracay, Palawan and Cebu hold the promise to fulfill every Korean bride's dream to have the most unforgettable honeymoon experience ever. Among Philippine mission members on hand at the fair include Mr. Hartwig R. Scholz, chairman of Badian Island Resort & Spa, Ms. Anngela M. Panaguiton, sales manager of Plantation Bay Resort and Spa and Ms Kathy P. Mercado, sales and marketing manager of Patio Pacific, Boracay. Ms Ebron said the Philippine islands have become the first choice of Koreans for their honeymoons. It is, thus, a very inspiring step to put forward Philippine's finest resorts into the Weddex Spring 2008. 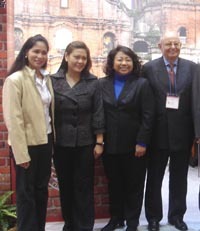 Hartwig R. Scholz, chairman of Badian Island Resort & Spa(right) poses for camera with Ms Basco-Ebron(second from right) and other Philippine delegates. The Badian Island Resort & Spa, Cebu is on the lagoon side of the small isolated Badian Island, off the southwest coast of Cebu. An 8-hectare beachfront resort surrounded by flowering gardens, white sandy beaches and blue waters. Rooms are large and beautifully designed using Philippine architecture. Located right in the center of the island, Patio Pacific Resort is accredited by the Department of Tourism and rated as an "AAA" Resort. From Patio Pacific Resort, all the other major attractions and destinations in the island like the different different bars and restaurants, the beach, and the famous dive spots that beckon from beyond the shores are just a few minutes. Patio Pacific Resorts offers business travelers and other corporate guests the opportunity to mix business with pleasure. For out-of-town meetings and other corporate gatherings, sales conventions, training programs as well as private parties, a fully-air-conditioned conference room is equipped with most modern equipment such as lapel and wireless microphones, audio-video facilities, overhead projector and three layer whiteboard. At Patio Pacific, foreign tourists who flock to Boracay can enjoy a taste of home. The Golden Bamboo offers mouthwatering servings of Chinese cuisine that rank as one of the island's best, Ms Kathy P.Mercado, sales & marketing manager of Patio Pacific Boracay said. In the meantime, tourists from South Korea remain to be the top visitors followed by China while efforts for building up newer areas such as India and countries in Europe also started to bear fruits. For this year, Ms Ebron went on to say that the Philippines will upgrade further its plans by promoting higher value tourism products and services to capture more tourists in the country. "The department will continue in its efforts to maximize the value of the travel sector given the current available infrastructure capabilities and resources. It will also explore new and innovative ways to better direct the tourism sector toward a healthy and sustainable future," she said. The continued depreciation of the dollar has not affected the Philippine tourism industry. The year 2007 was even a year of breakthroughs for Philippine tourism, with the number of foreign arrivals breaching the three million mark, she said. Earlier, Philippine Tourism Secretary Durano said that it was more important to note how tourists infused a whopping US$4.8 billion into the Philippines economy in 2007. 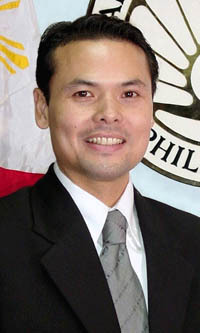 The tourism chief said that prior to 2004, tourists only spent a total of US$2 billion in the Philippines. "We are targeting the same markets this year, but with more emphasis on value rather than volume," Durano said, explaining that value meant convincing tourists to spend more money and stay longer in the country. Durano gave as an example the European market, which he described as one of the country's best-performing markets in 2007. "Europeans stay for two to three weeks in the country, spending more than other tourists who stay here for only a number of days," Durano said, noting that the Russian market grew by 128 percent in 2007. 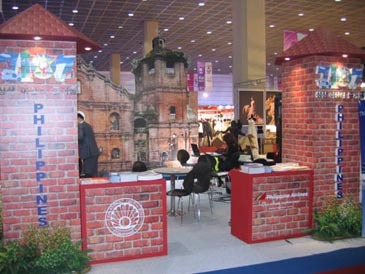 Stylish national pavillion of the Philippines at Weddex Spring 2008. "We will be pushing for high-value tourism such as shopping and wellness services,"he added. Durano said that for 2008, the department would be focused on the opening of new projects and properties such as hotels and infrastructure. The DOT would also work for more direct flights to the provinces such as in Aklan and Palawan to encourage more tourists to visit the country's "poster spots," the tourism chief said. He said the Department of Tourism (DOT) sees tourist expenditures to grow to $5.8 billion this year. Durano cited the growth in tourist arrivals and tourist spending to heavy promotions, growth of tourist-related industries such as hotels, and increased load of airlines. He said DOT will also continue their strategy in encouraging more tourists to stay longer in the country, hence making them spend more during their stay. He said tourists coming from more distant places such as Europe stay in the country for two to three weeks on the average. The DOT will also push for the creation of higher value tourism products and services in the areas of shopping, wellness, education, and conventions, among others.